Hmm! That is what i was thinking what kind of comparative choice is this? I think it will also store around 300 Bly-rays. No longer need the physical disc. But to a number of movie buffs, like me, 300 is a mere pittance of the number that is owned. I would rather spend a few $100's and add more DVD cabinets and have the disc. Did you watch some 3D Blu-ray movies? Our fp is not 3d, but I have watched 1080p, and 4k Movies with it. The last Beta firmware update (May 25) has enabled Dolby Vision. 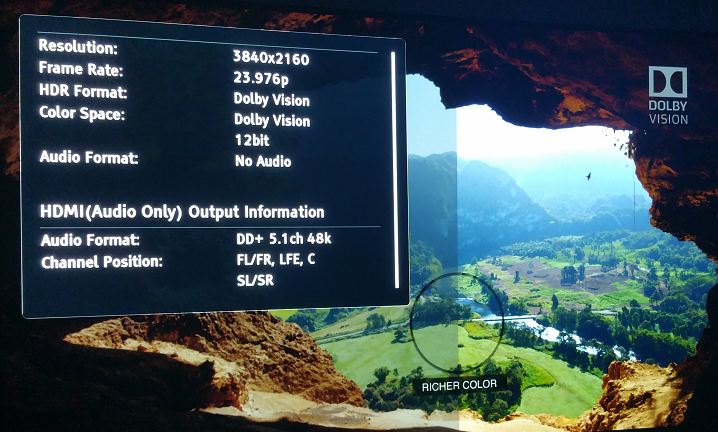 It is not officially confirmed but from screenshots provided by some owners Dolby Vision is indeed activated now in the Oppo 203/205. Dolby is most likely telling Oppo to not confirm yet. This is ↓ from the 203's USB port with a Dolby Vision demo, and LG OLED TV. We live in interesting times, the world is becoming more interesting, more expanded, more independent, more revealing, more reaffirming, more matter fact. Turns out there is a huge price difference. Now I'm wondering if I should splurge on the Kaleidescape or buy the OPPO 203 until I can afford a more expensive unit. I feel like the quality has to be nicer on the Kaleidescape, but would love to hear some feedback. Let's see: Kaleidescape around $4500, Oppo 203 around $549. I know what I would get.